Apple Unveils New iPhones — One Innovative, One Cheap : The Two-Way Apple CEO Tim Cook reveals two new iPhone models — one includes a fingerprint reader to unlock the device, and a less advanced model is aimed at the cost-conscious consumer. Phil Schiller, Apple's senior vice president of worldwide marketing, speaks about pricing for the new iPhone during an Apple product announcement on Tuesday. Apple unveiled its replacement for the iPhone 5 — one for the top end of the market that features an innovative new fingerprint security device, a faster processor and longer battery life; and a second budget phone that will retail for as low as $99. CEO Tim Cook was joined by other Apple executives at the Cupertino, Calif., headquarters for the long-anticipated and hyped announcement of the iPhone 5s and iPhone 5c. The iPhone 5s will include Touch ID, a new home button that reads a user's fingerprint to unlock the phone instead of relying on a cumbersome pass code. It includes a new, 64-bit processor, called the A7, which Apple says will be "up to twice as fast" as the A6 processor in the current iPhone 5. The 5s will be available in silver, gold and "space gray," and provide battery life "as good as or better than the iPhone 5" — 250 standby hours as opposed to the 225 standby hours for the iPhone 5. The iPhone 5s also features an advanced camera and a "motion coprocessor" for sports and exercise applications. The 16 gigabyte version will sell for $199; the 32 gigabyte for $299; and a 64-gigabyte version for $399. The iPhone 5s will release on Sept. 20. The new device is 56 times as fast as the original iPhone released in June 2007, Cook said. The iPhone 5c will largely match the capabilities of the current iPhone 5, but at a lower price. It will sport a plastic case with the option for a variety of colors. 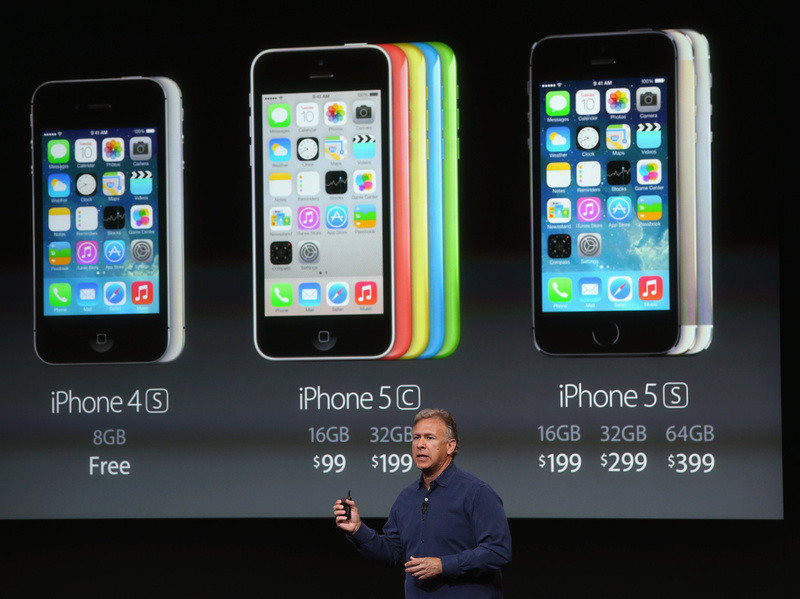 A 16 gigabyte version of the iPhone 5c will sell for just $99, while a 32-gigabyte version will retail for $199. Phil Schiller, senior vice president of worldwide marketing at Apple, said the new iPhone 5s is "the most forward-looking phone we have ever created." The budget 5c, which still uses the A6 processor, will be available for preorder on Sept. 13 in five colors — green, blue, yellow, pink or white. Cook called the phone "absolutely gorgeous," and "more fun and colorful" than any other iPhone. Apple's new iOS 7 operating system will be available for free download on Sept. 18, and will be compatible with all devices that are iPhone 4 or more advanced. Craig Federinghi, head of software at Apple, said downloading the iOS 7 will be "like getting an all new device." With increasingly stiff competition from smartphones running Google's Android operating system — especially Samsung's Galaxy line, Apple will be banking on success for its newly unveiled line. The cheaper iPhone 5c, seems to be aimed partly at the overseas market, where the iPhone's premium price tag has turned off cost-conscious consumers. NPR's Krishnadev Calamur, writing for the Parallels blog, says Apple has been losing marketshare in China. As Krishnadev notes, China represents the world's largest smartphone market, but the less expensive Samsung models and a phone made by Xiaomi, "a company that's dismissed by some as an Apple knockoff," have been making steady inroads.